This example demonstrates the use of INPUT_PULLUP with pinMode(). It monitors the state of a switch by establishing serial communication between your Arduino and your computer over USB. Additionally, when the input is HIGH, the onboard LED attached to pin 13 will turn on; when LOW, the LED will turn off. Connect two wires to the Arduino board. The black wire connects ground to one leg of the pushbutton. The second wire goes from digital pin 2 to the other leg of the pushbutton. Pushbuttons or switches connect two points in a circuit when you press them. When the pushbutton is open (unpressed) there is no connection between the two legs of the pushbutton. Because the internal pull-up on pin 2 is active and connected to 5V, we read HIGH when the button is open. When the button is closed, the Arduino reads LOW because a connection to ground is completed. Now that your setup has been completed, move into the main loop of your code. When your button is not pressed, the internal pull-up resistor connects to 5 volts. This causes the Arduino to report "1" or HIGH. When the button is pressed, the Arduino pin is pulled to ground, causing the Arduino report a "0", or LOW. Now, when you open your Serial Monitor in the Arduino environment, you will see a stream of "0"s if your switch is closed, or "1"s if your switch is open. 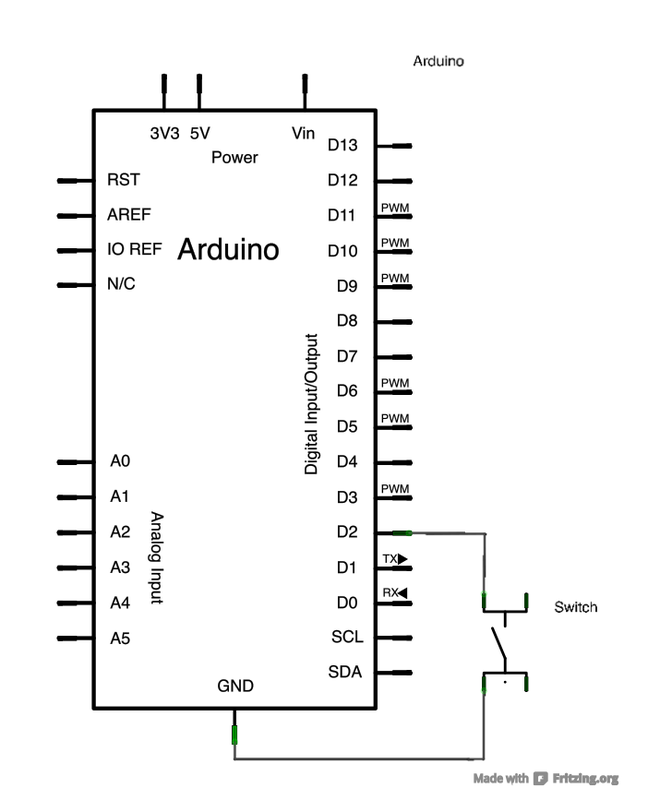 Blink Without Delay: blinking an LED without using the delay() function. Button State Change: counting the number of button pushes. Input Pullup Serial: Demonstrates the use of INPUT_PULLUP with pinMode(). Tone: play a melody with a Piezo speaker. Pitch follower: play a pitch on a piezo speaker depending on an analog input. Simple Keyboard: a three-key musical keyboard using force sensors and a piezo speaker. Tone4: play tones on multiple speakers sequentially using the tone() command.